LOS ANGELES (AP) Credit the Goon Squad with a big assist. The Clippers’ bench narrowed a 10-point deficit to one heading into the fourth quarter, and Los Angeles hung on for a 109-104 victory over the Denver Nuggets on Wednesday night. Blake Griffin had 20 points and 12 rebounds, Montrezl Harrell added 18 points and Lou Williams had 17 for the Clippers in their season-high sixth straight win. Los Angeles is 12-3 in its last 15 games, tied with Golden State for the NBA’s best record over that span. The Clippers were just 7 of 14 from the free-throw line over the final 3:09, but escaped with the help of last-second turnovers by Will Barton and Wilson Chandler. The Nuggets had 21 turnovers. ”That’s back-to-back nights where defenses have turned up the pressure, turned up the heat and we have not handled it well,” Nuggets coach Michael Malone said. Gary Harris scored 19 points in the Nuggets’ fifth straight road loss. Nikola Jokic added 18 points, Barton had 17 points and Mason Plumlee had 16 points and 14 rebounds. 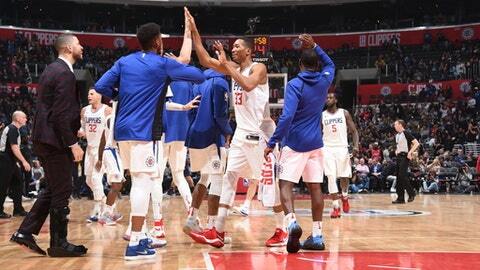 The Nuggets led by five early in the fourth, but the Clippers scored eight straight points, including five by Wesley Johnson, to go up 90-87. Neither team led by more than seven points the rest of the game. Clinging to a 99-98 lead, Harrell missed a pair of free throws, shaking his head as he backed away from the line. He got fouled twice more in succession and made 3 of 4, extending the lead to 102-98. Harrell came up with a block on Plumlee at the other end, and Johnson hit a 3-pointer, making it 105-98. Denver got to 106-104 on four straight points by Harris and two free throws from Barton. The Nuggets ran off 11 straight points for a 79-69 lead in the third only to blow all of it. The Clippers answered with their own 11-0 spurt, including consecutive 3-pointers by Tyrone Wallace and Harrell, to lead 80-79. Emmanuel Mudiay’s basket sent Denver into the fourth leading 81-80. ”If teams are watching us, they’re just going to ratchet up the pressure and watch us turn the ball over and self-implode.” – Malone. Nuggets: They are 8-14 against the Clippers at Staples Center over the last 11 seasons. … Denver fell to 7-17 on the road overall and 3-13 against the West away from home. Clippers: C DeAndre Jordan (sprained left ankle) missed his third straight game and the swelling hasn’t gone down. Jordan had initially been expected back Saturday in Utah, but Rivers said he’s not ready and won’t be rushed. … G Austin Rivers (right ankle) has missed eight straight games. He is wearing a boot and will be re-evaluated in the next week. Nuggets: Host Phoenix on Friday, having beaten the Suns by 23 on Jan. 3. Clippers: At Utah on Saturday. The teams split their first two meetings, both in Los Angeles.